Background: In Suceesfactors Employee Central, we can configure the dependent data maintenance screen in “Manage Business Configuration”. 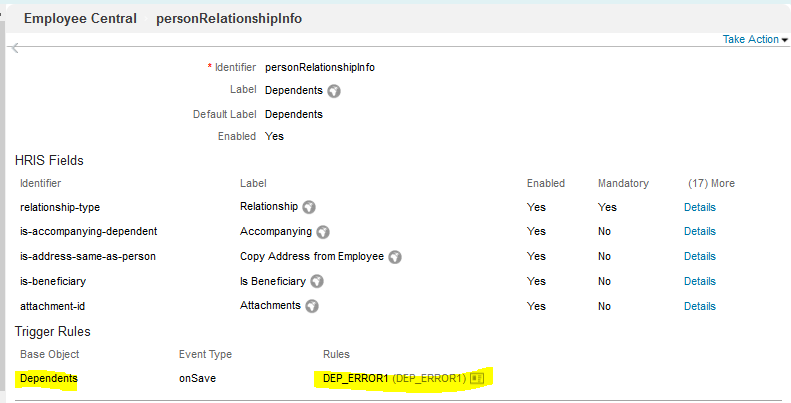 The main identifier for dependent data maintenance in Manage Business Configuration is “personRelationshipInfo”. After configuring the “personRelationshipInfo” identifier, we configure the other additional portlets (like Home Address/ National ID etc.) 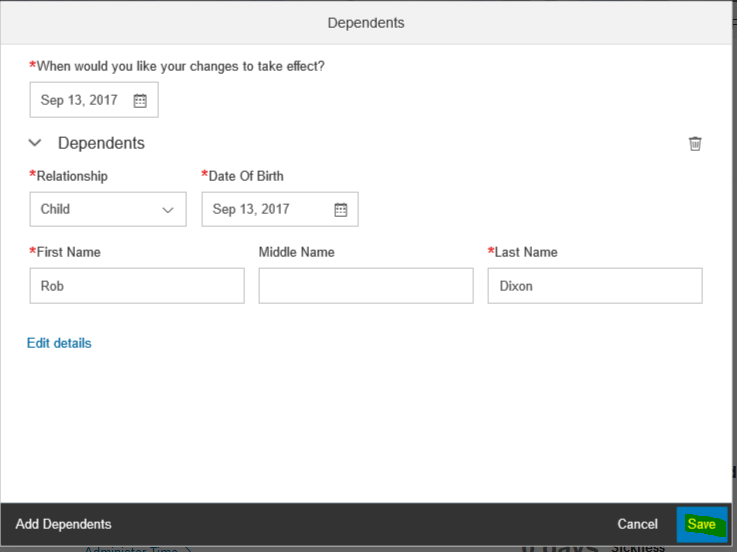 for dependent by selecting the value for “Disabled For Dependents” option on Home Address/ National ID portlet. 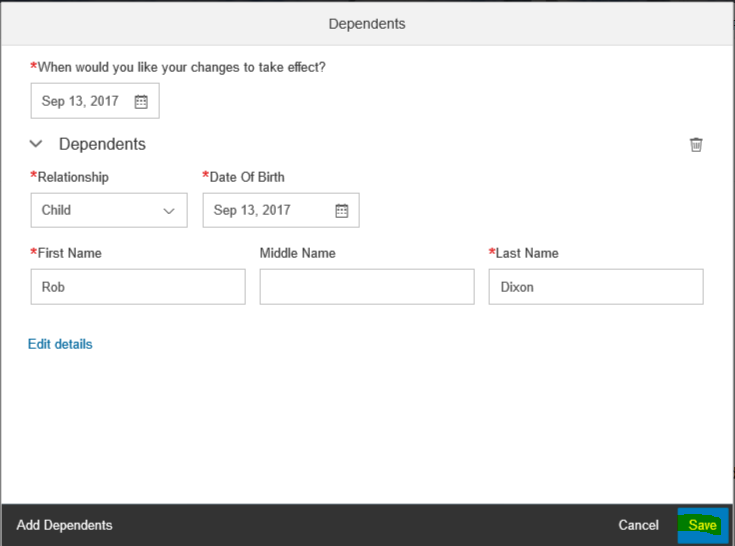 For Personal Information of dependent, we have to create new UI Config & Enable the same. When the configuration is done for dependent, the ESS screen for dependent maintenance looks like the below screen. In the main screen, it does not show all the other fields (national id/home address etc.) which are required for dependent. 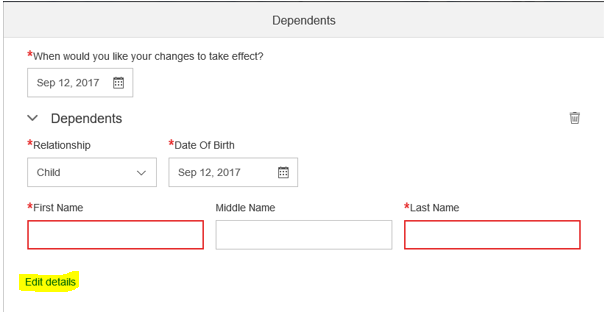 To maintain the other fields employee has to click the Edit details link & then the additional detail can be maintained. Now here the issue is that if employee forgets to click the Edit details link (which is very common) & press the save button in the main screen then data is saved without the additional information & system does not show any error/warning message for that. Because of that data discrepancy remains in employee dependent information. We can introduce a simple Business Rule to force employee to click the Edit details link at the time of dependent data maintenance. To build the rule first we have to identify the portlets which will be mandatory for dependents. Say for Example we want National ID & Biographical information portlet to be mandatory. Add the rule on “onSave” Event Type for identifier “personRelationshipInfo”. Employee access the dependent data maintenance screen. Employees does not click the Edit details link & press the save button. 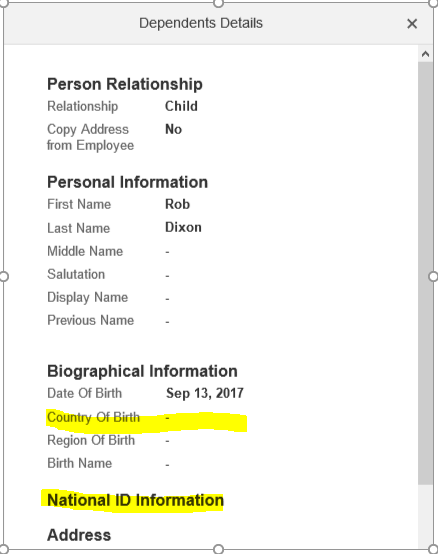 Data is saved without the national id. 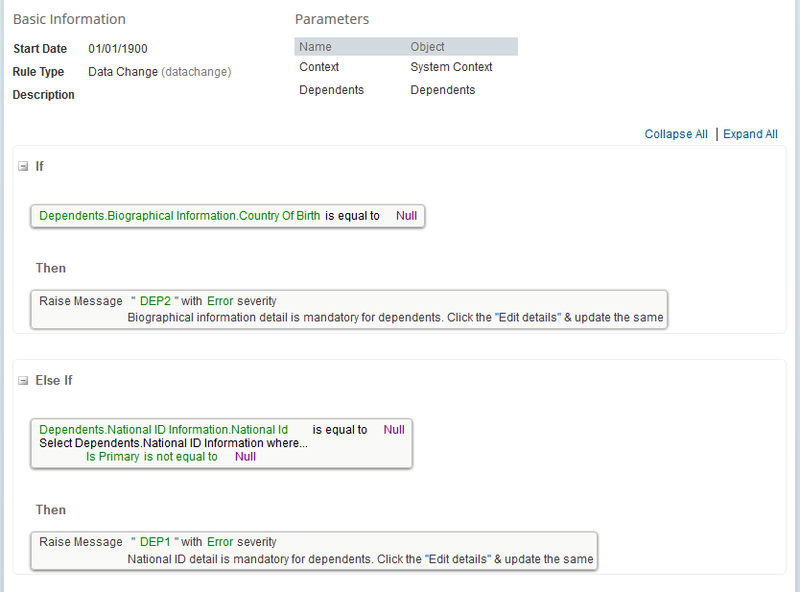 Overview of the saved Data: Here we can see that there is no National ID information & Country of Birth is missing though it is a mandatory field for dependent’s biographical information. Employee press the save button without clicking the Edit details link & system throws error message. Then employee is forced to click the Edit details link. 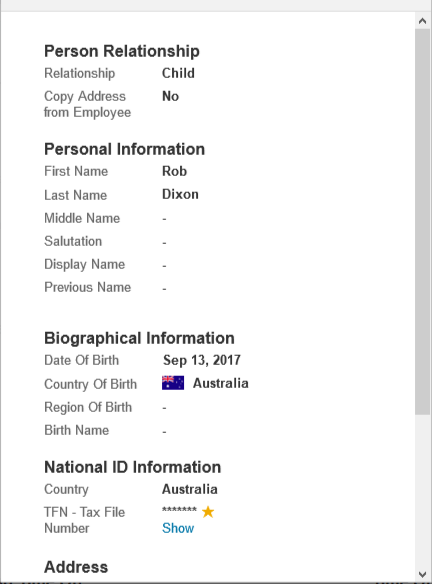 Employee clicks the Edit detail & key in the country of birth without providing any detail for National ID & press the save button again. System throws error message for the National ID. Then employee is also forced to provide the National ID. With this simple trick we can easily achieve the useful functionality in Successfactors Employee Central.